When I was a kid my favorite ball players were Cal Ripken Jr. and Ken Griffey Jr. It has been years since Cal last took the diamond and it may seem like its been years since we heard from Junior Griffey. Since his move to Cincinnati in 2000, Griffey has been plagued by injury after injury. Missing over 400 games due to injuries between 2000 and 2007, Griffey continued to march forward toward the Hall of Fame. So when Ken Griffey blasted is 600th career home run Monday evening the first question that must be asked is, What if he had played in those 400+ games? Griffey, who in his prime (1996-2000), was averaging 49.8 homers a season and 137 RBIs, was the undisputed best player in the game. While smashing the ball out of every ballpark Griffey was still averaging 170 hits a season and grabbing 15-20 bags every summer. Griffey was mentioned before Bonds, Sosa, & Big Mac as the guy who would eclipse Henry Aaron as the eventual home run king. On Monday evening Ken Griffey joined Bonds, Sosa, Ruth, Mays, and of course Aaron as the only six players to ever hit 600+ home runs in a career. As Griffey continues to pile up his statistics in a sure to be hall of fame career, he still remains the most modest of superstars. In a time when questions whirl around every Major League milestone passed, Griffey remains unquestioned. The ten-time gold glover and two-time American League MVP may never reach the ultra-exclusive club of Major Leaguers to hit 700 home runs but I refer you to his pace pre injury plagued seasons. At the end of the 2001 baseball season, a season which Griffey sat 51 games with injury, he had smashed 460 home runs in his career. It wasn't until June 20th, 2004 that Griffey put #500 into the seats. 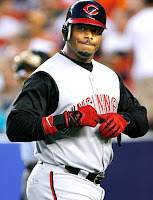 In the three seasons from 2002 to 2004, Griffey played in 206 games out of a possible 486 games. Without even looking further into the numbers you can see that Griffey with 460 homers in 2001 would have easily hit #500 twelve to fifteen months earlier than he did. Even after his prime officially ended and the injuries had plagued his career in Cincy, Griffey wasn't done. For the last three seasons, seasons which Griffey played over 100 games in each, his home run totals went 35, 27, and 30 in 2007. For Junior to reach 700 at a pace of 30 each year he would hit 700 after his 41st birthday. With seven hundred home runs in a career Griffey would be 62 homers away from Bonds' mark of 762. Would anyone honestly say we wouldn't have a different home run king if Griffey hadn't missed all those games due to injury? One of the greatest assumptions of the steroid era is that Major Leaguers had unnatural power and athletic ability. That assumption is false, the unnatural part was the ability to stay healthy and get back in the batters box or on the pitchers mound. Questioned stars Roger Clemens and Barry Bonds were able to do that, Junior wasn't. All due respect to Barry Bonds, the greatest ball player I've ever seen play is Ken Griffey Jr.